Facebook issued yet another update to its Trending feature, with three major changes rolling out to users in the U.S. starting Wednesday. Trending topics will now feature a headline from a publisher along with each topic. When the social network updated Trending last August, descriptions for Trending topics, which had been added by Facebook employees, were removed, leaving only the topics themselves and no indication as to why they were in the news. The system to determine what topics are trending has been updated with an eye toward avoiding stories from a single source and including those that are being covered by multiple news outlets. Trending topics will no longer be personalized, and everyone in the same region will see the same topics. 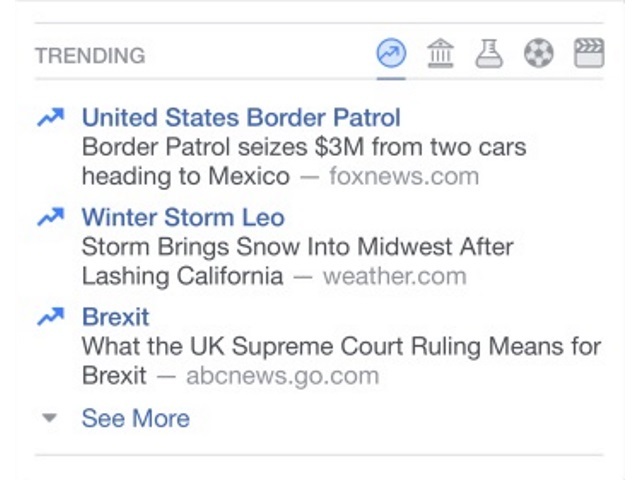 In order to provide people with more context on what is trending on Facebook, we will now display a headline from a publisher’s article about that topic. This was the most requested feature addition since the last update we made to Trending in August. These are the same headlines that appear when you hover over or click on a Trending topic, but people told us they wanted these headlines directly within Trending, too. The headline that appears is automatically selected based on a combination of factors including the engagement around the article on Facebook, the engagement around the publisher overall and whether other articles are linking to it. Just as before, after clicking on a topic, people are taken to a personalized results page that includes additional sources and posts about the topic. We’re also updating how topics are identified as trending on Facebook. Previously, topics may have trended due to high engagement on Facebook around a single post or article. With today’s update, we will now look at the number of publishers that are posting articles on Facebook about the same topic, and the engagement around that group of articles. This should surface Trending topics quicker, be more effective at capturing a broader range of news and events from around the world and also help ensure that Trending topics reflect real-world events being covered by multiple news outlets. Lastly, the list of which topics are trending on Facebook will no longer be personalized based on a someone’s interests. Everyone in the same region will see the same topics. This is designed to help make sure people don’t miss important topics being discussed on Facebook that might not show up in their News Feed. Readers: Are you seeing the new Trending features yet? What are your initial thoughts?